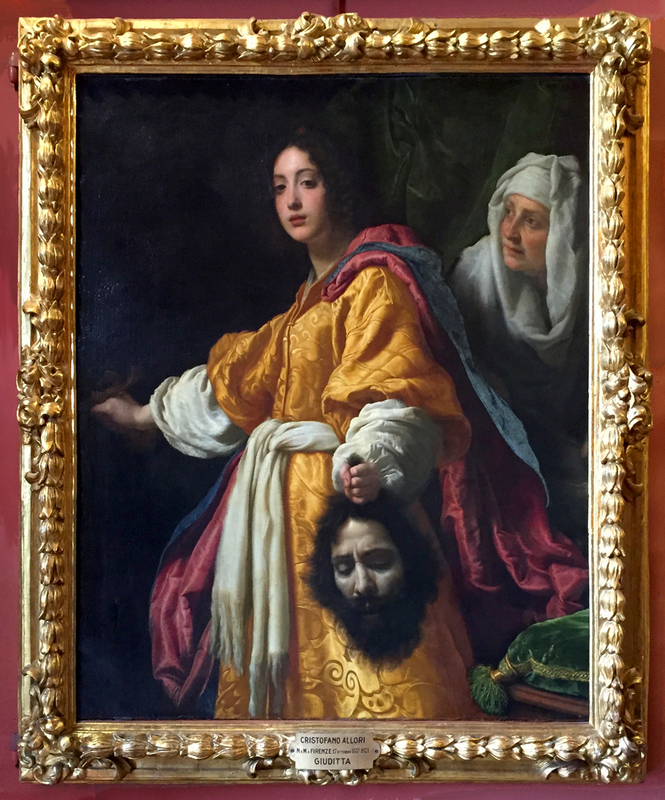 The Dulwich Picture Gallery owns a small and beautiful version of Cristofano Allori’s Judith, which has languished for some time in a most unsuitable frame. In an act of dramatic imagination which rivals the Baroque richness of the composition, it has been recently reframed in a setting which has brought it magically alive. 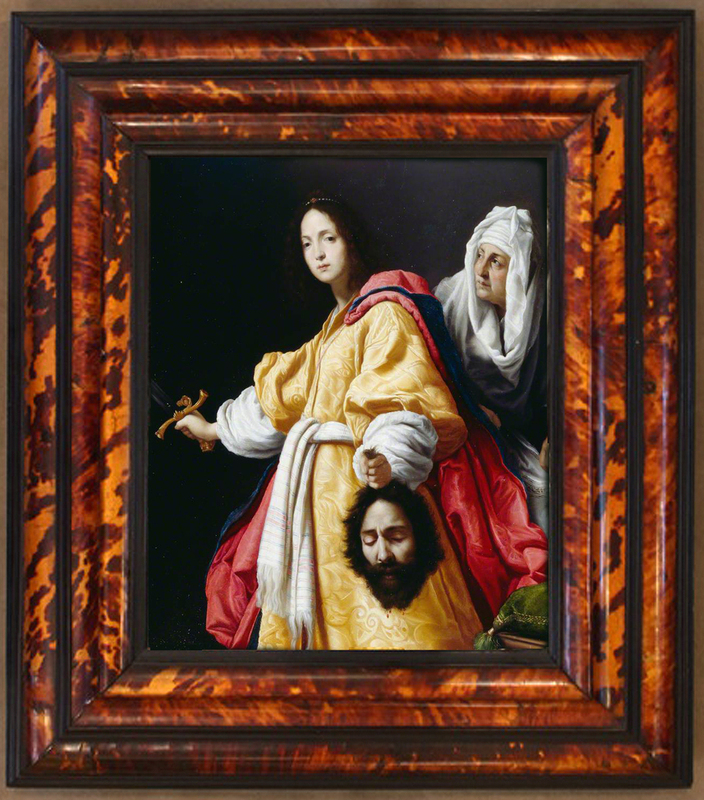 This is one of several versions of Allori’s Judith, which came by bequest to the Dulwich Picture Gallery in 1811, as part of its original collection of 370 paintings amassed by the art dealers Francis Bourgeois and Noël Desenfans. This collection had been put together at the bidding of King Stanislaus of Poland between 1790 and 1795, at which point the king was forced to abdicate, leaving the two dealers with a large number of important and very high quality paintings, mainly – like the Allori – late Mannerist or Baroque in style. 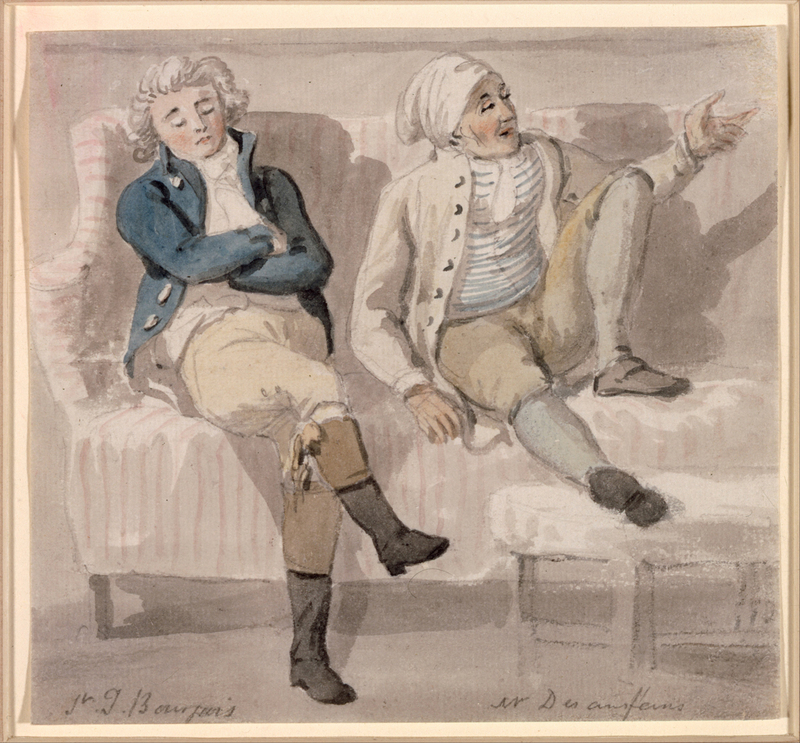 They were unable to sell the collection as a whole, and after the death of Desenfans in 1807, Sir Francis left it – via Desenfans’s widow – to Dulwich College (which already owned two earlier bequests), on condition that it should be opened to the public. 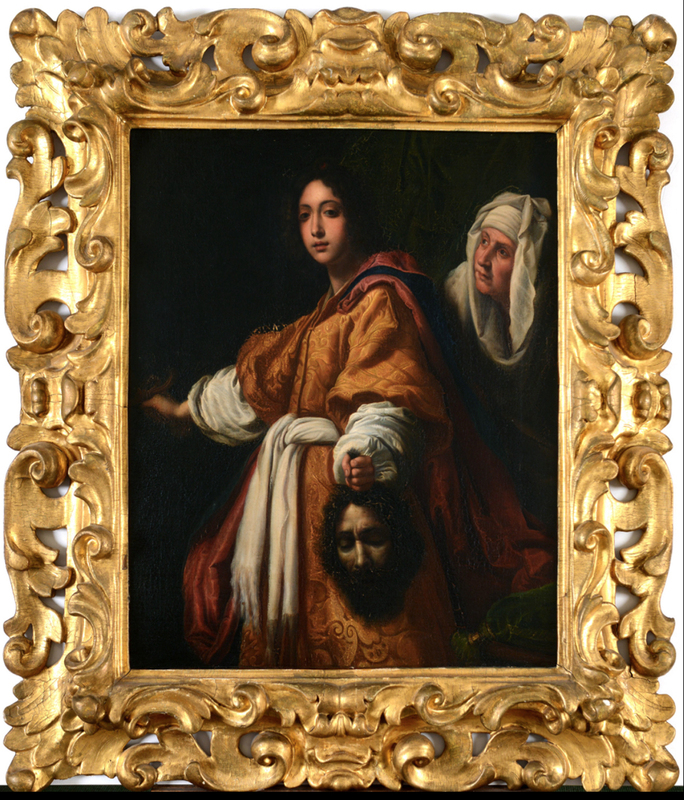 There is an original, early Judith by Allori in the Royal Collection, which was probably acquired by Charles I as part of the Mantua collection; it is framed in a Baroque British pattern, with a centred, gadrooned top edge. Xavier Bray has noted that the present painting is of such quality that it may be a quarter-size autograph version of this work. 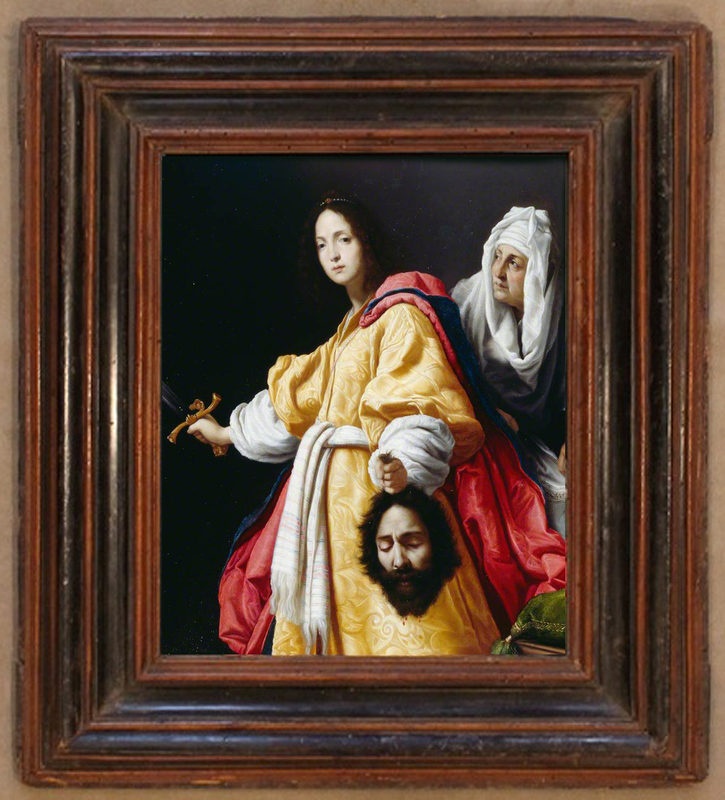 There is also a more idealized Judith from Allori’s hand in the Palazzo Pitti in a Baroque bunched-leaf frame (above) , a slightly larger copy after it in the Rijksmusem, and one attributed to Allori in the Gemäldegalerie, Berlin; as well as copies elsewhere – in the Liechtenstein Collection; in the Uffizi; the Vatican; the Kunsthistorisches Museum, Vienna; Nottingham Castle; and Tabley House, Cheshire (another smallish version). 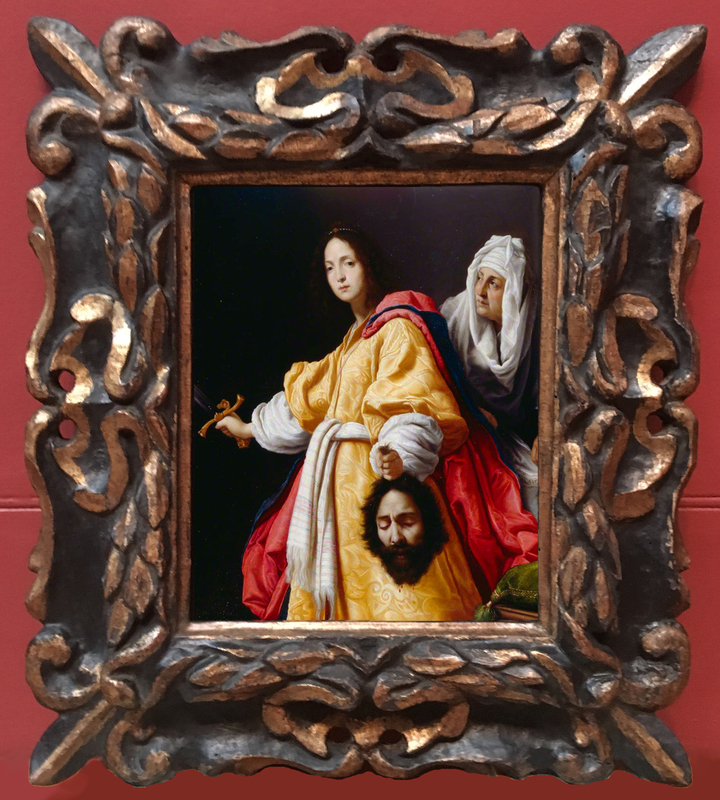 Other copies can be found on the art market; above, in a ‘Medici’ style frame, and here, in a Baroque shell frame. ‘My Ladys Closett… 4 pictures on Copper in Ebbony frames (viz) a St Stephen, a St Laurence, an Appollo & Midas, Appollo fleying a Satir by phillipa Laura’ . these included paintings on slate and on copper. 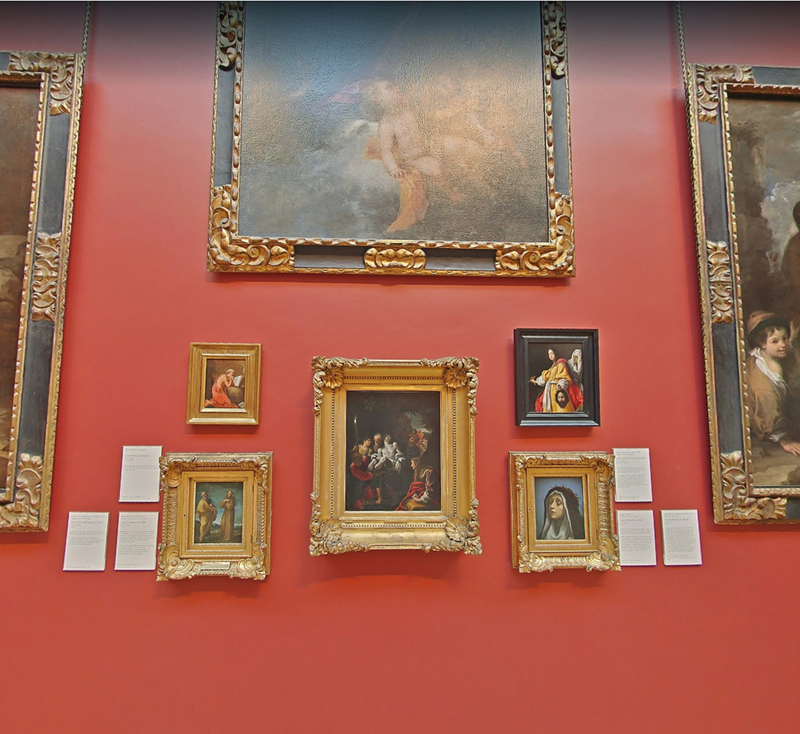 The Dulwich Judith may also have had an ebony frame at some point; although a painting of the interior of the Gallery in 1830 shows frames which, although by no means uniform, are also by no means other than gilded, ornamented, and mostly contemporary. 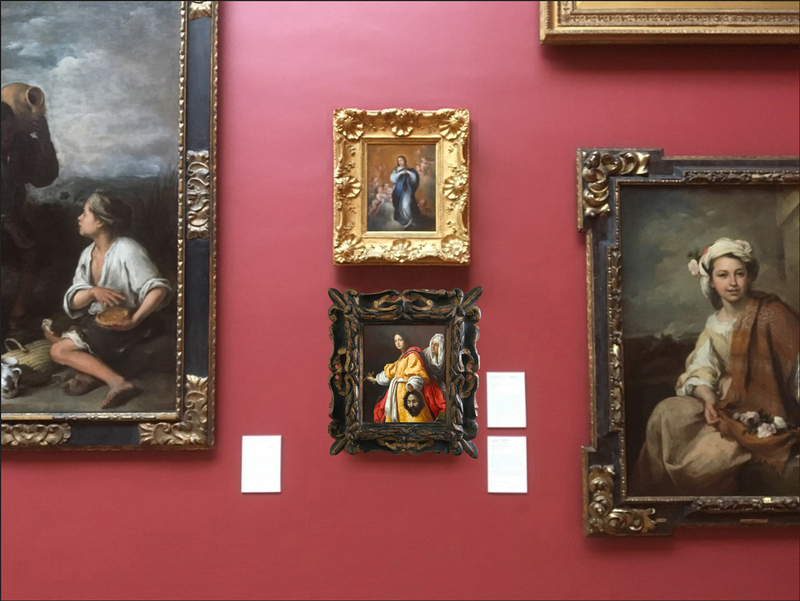 These are, in many cases, the frames still remaining on the paintings; Veronese’s St Jerome can be seen on the left of James Stephanoff’s Viewing at Dulwich Picture Gallery, in its Louis XV revival frame. 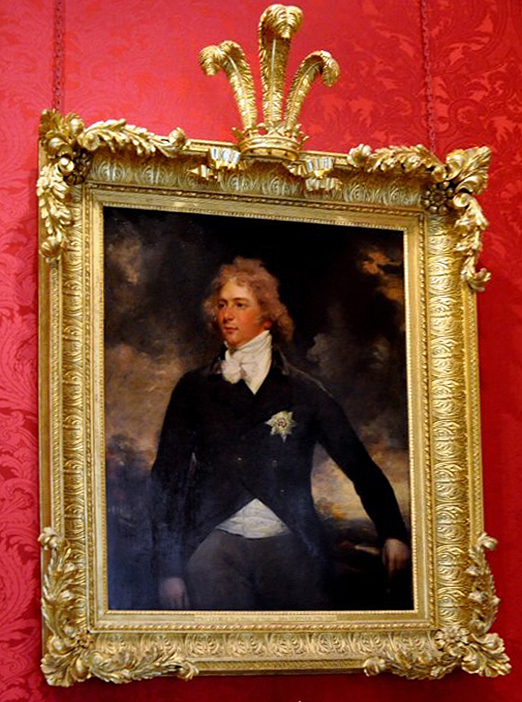 Other paintings in the Bourgeois collection have Regency frames with concave profiles and acanthus-&-shell corners, very much in the style of patterns produced by John Smith, framemaker to Georges III and IV . 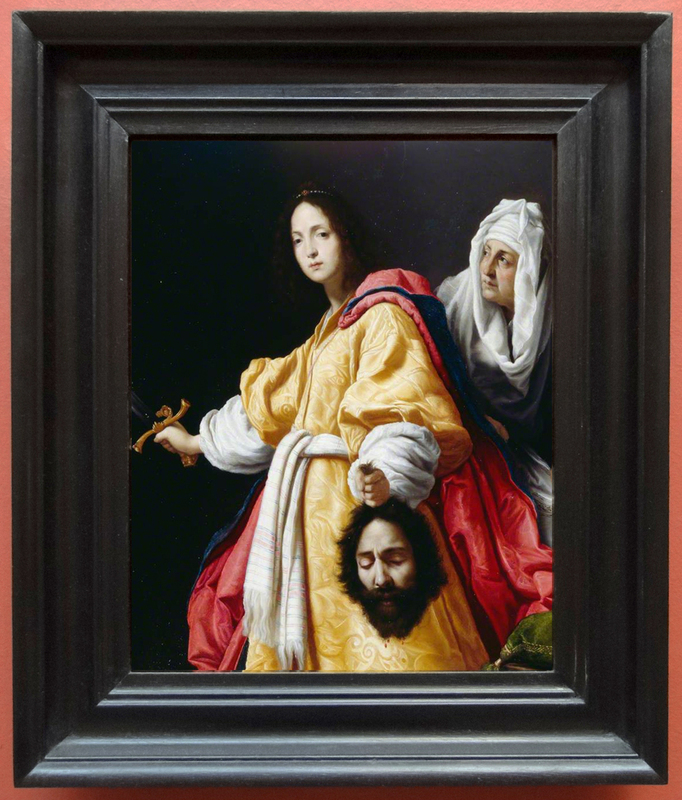 The example above, on a relatively small painting, may indicate that the Allori Judith could have been framed in a similar style. 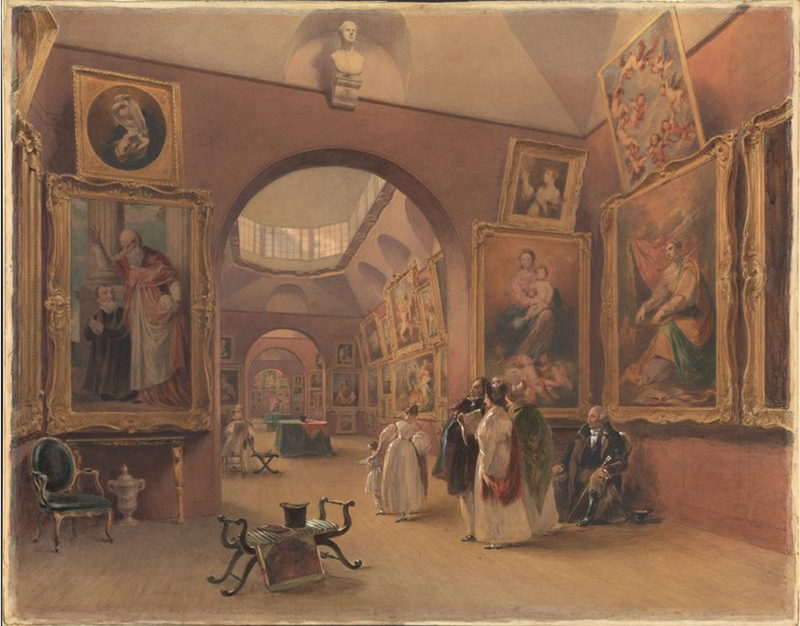 It is not inconceivable that, as part of Sir John Soane’s reconstruction of the Gallery between 1812-14 to meet the terms of Bourgeois’s bequest, many of the paintings were reframed for display in a number of variations on a gallery-style of frame, and that John Smith might have been chosen for this prestigious task (although he was also an expensive choice, and Soane had striven to keep his own costs down). Whatever its past history of presentation, the Judith has been entombed for some time in an extremely unattractive plain linear moulding, with machined regularity and a plasticky black-painted finish, which did nothing to show off the remarkable dynamism of the composition. It also covered the painting by around 5mm. on each side. 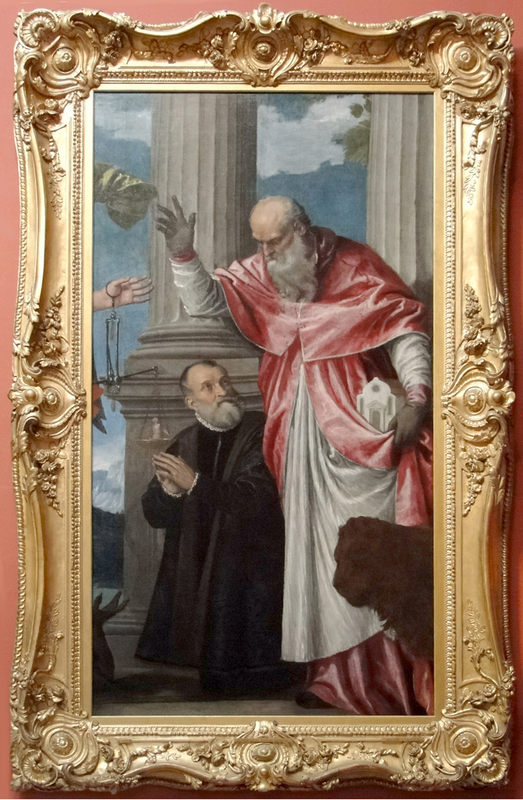 Dr Xavier Bray, who was until mid-2016 Chief Curator of the Dulwich Picture Gallery (and since then Director of the Wallace Collection), wished ‘to give the painting more significance in the hang’, and approached Peter Schade. First, a 17th century Baroque bolection frame, with raked and centred acanthus leaves clasped over the top moulding, painted and parcel-gilt. The radiating effect produced by the leaves emphasizes the composition, leading the eye inward and enhancing the shallow space in which the figures stand, whilst the gilding gives animation and variety, opening up the picture, where the plain black moulding flattened and deadened it. The bolection profile acts, as all such Baroque mouldings do, to push the painting outward from the wall, giving it greater presence and authority. The second option was another bolection frame, with a profile formed of a sophisticated pattern of stepped convex and small cavetto mouldings, made of stained, polished and painted walnut. Here, the parallel lines of the mouldings form a perspectival tunnel, which seems optically to recede towards the painting rather than pushing it outward. This use of inset and projecting surfaces, which create exaggerated effects of light and shadow, is characteristic of Baroque architecture; this frame mimics on a tiny scale the movement and drama generated by the façade of a 17th century cathedral, and echoes the theatricality of Allori’s brilliantly-spotlit scene. The third choice was another bolection profile, veneered between ebony trims with strips of tortoiseshell, which were probably laid over gilded wood to achieve such a light tone and bright amber colouring. This frame had many of the advantages of both the others, but its bright register overwhelmed the artist’s succulent use of saturated colour; and although it effectively isolated the painting from the wall it hung on, it also took away some of the intense theatricality and opulence from the painting. There was one final and idiosyncratic option – a small 17th century Florentine frame, boldly carved with a bay-leaf garland between scrolling concave rails, centred with primitive pierced mascarons, and finished with fleur-de-lys corners. This might seem a counter-intuitive choice for a painting so detailed and miniaturist in its technique, but the contrast of large, roughly-blocked forms and equally unrefined gilding provided the perfect foil for the panel. The design reflects the influence of the ‘Sansovino’ style, which appeared in Tuscany as well as the Veneto, and is therefore appropriate for the work of a late Mannerist Florentine artist. 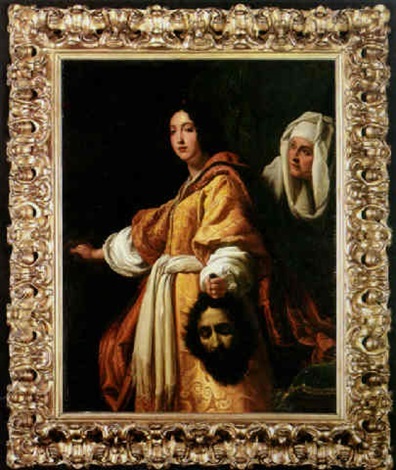 The motifs which decorate it are also fortuitously suitable: the bay-leaf garland underlines Judith’s victory over the enemy general, Holofernes; the fleur-de-lys is the emblem of Florence, and the mascarons, like sinister bird masks, emphasize the horror of a scene which the enamelled style of Allori’s work partly disguises. The painted and parcel-gilt finish had acquired a soft and aged patina which was much less overwhelming for the painting, than, for example, the tortoiseshell frame. In a final happy touch, the panel dropped into the frame, exactly fitting it. More of the sword was revealed, at the left; the maidservant’s hand appeared on the right; and rather more of Holofernes’s couch could be seen. These additions set the composition more comfortably back into the frame, allowing a better relationship with the spectator. 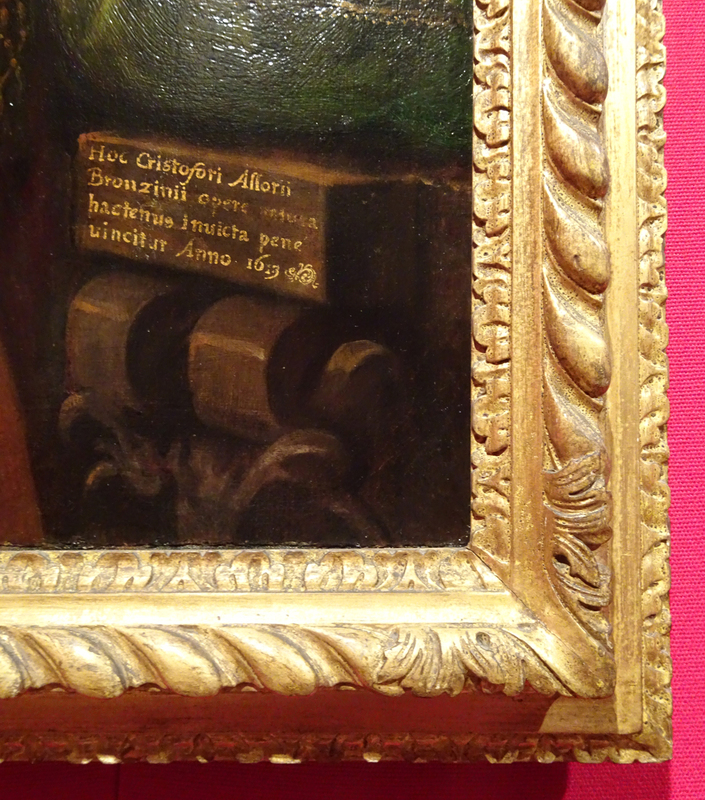 The result can be seen in the partial new hanging of the wall where the Allori lives. 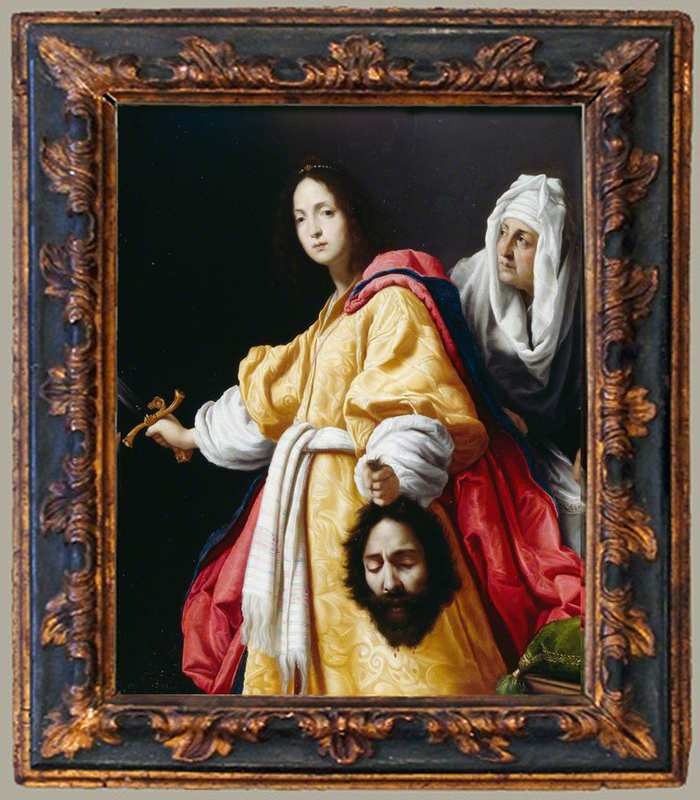 The painting which previously seemed like an afterthought on the outskirts of strangely-composed grouping now shines out at eye-level, its frame relating happily to the Murillos on either side of it, and itself given so much more importance and prominence by this bold and dramatic act of reframing. John Somerville, Jon Culverhouse & Miranda Beck, Burghley: a guide to the paintings, 2016, p. 6. 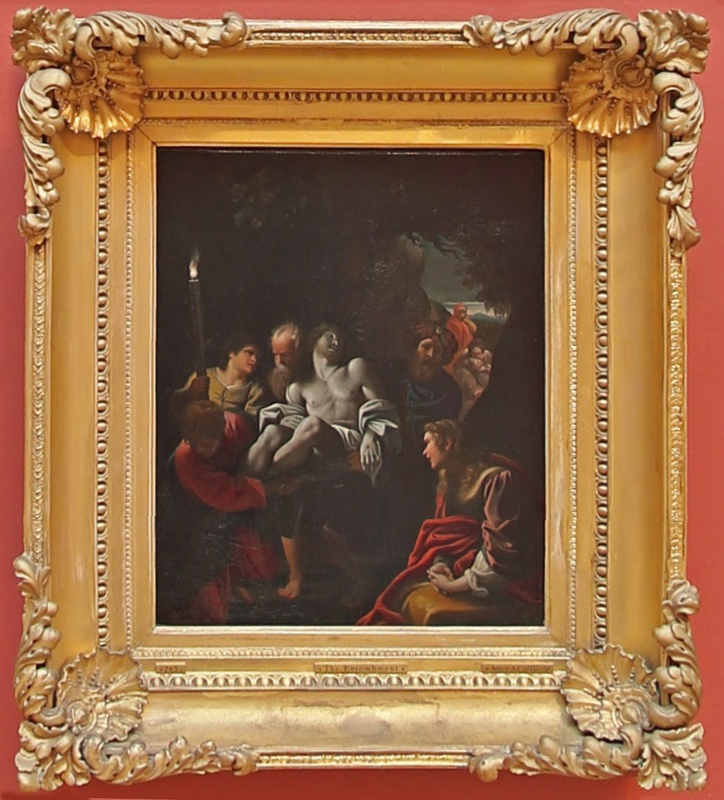 The Filippo Lauri Martyrdom of St Lawrence (in the Ante Chapel at Burghley) has since been transferred to an ornamental gilt frame. Into the thought processes that should set the standards for all reframing projects.